I spoke with Jon this morning and he is coming home! "Hero guide spent day tending to dead friends"
It has been an extremely sad time since the avalanche disaster in which 16 people were killed. The Sherpas voted and have decided to close the mountain this year. Jon is taking a helicopter from Everest Base Camp to Lukla at 8am tomorrow (7:15pm tonight PST). From there, he'll take a plane to Kathmandu and then make his way home. Just a note to summarize the last few days. Our Sherpa friends have decided to use this tragedy to further their cause with the Nepal government. All of the climbing Sherpa (as opposed to the Sherpa that help us establish and maintain base camp) have left the mountain and have stated that they will not return until their requests are met by the Nepalese government. What they're asking for is certainly deserved and we support their cause 100%. They simply want the families of the deceased to be taken care of as well as assurances that they themselves and their families will be taken care of should they be hurt or killed while climbing Everest. There are other requests on their list (15 in all) but this is the general idea. As I mentioned we feel that most of what they're asking for is valid and overdue. From what we understand 10% of Nepal's GDP is based on Everest revenue. It may be true that we climbers have substantially increased the quality of life here in the Khumbu Valley with all the money that's spent here climbing this mountain and trekking about but we hope that the government remembers that the climbing Sherpa are the ones putting their lives on the line, right along side us, on a daily basis. We cannot climb this mountain without them by our sides just as they were not able to climb it without our logistics and resources; we make a perfect and inseparable team. From the very beginning (1953) until today, Everest is climbed not by individuals but by partnerships. There have been some horribly misinformed comments made lately about the relationship between the Sherpa people and western climbers. As I mentioned, both parties consider the other as equal partners in this quest. We take care of each other 24 hours a day. When the avalanche hit, it was actually western climbers (many of which were actually from our party) who spent the day, on the scene, treating the wounded and extracting the dead. We did not run from the scene. As a matter of fact, our western guides from camp one and from the Football field rushed towards the debris into the danger and were some of the first on the scene. We have several MD's as clients on our climbing team and some these docs spent their entire day volunteering their time down at BC medical treating the wounded and pronouncing the unfortunate dead. I write all of this to clear the air of the misinformed nonsense about our relationship with our Sherpa partners. We and the Sherpa people are a team of equals and there were many tears spilled and stomachs turned as we brought our friends down one by one. We don't know how long it'll take this government to respond to the Sherpas' requests and we have limited time to move up this mountain. Several teams have already thrown in the towel and are headed downhill out of BC now. As for Marcus and me, we've decided to give it our all. We came here to climb E and we'll wait here patiently until our expedition leader tells us we can go up or we must go down. I think we're ready to climb this one. I think the weather is looking better by the day. The mountain conditions are certainly acceptable and we have the absolute best team (IMG) behind us. Avalanches happen in the mountains. As we lay in our tents we hear them crash down around us several times everyday. Unfortunately, this is part of the risk; part of the adventure that we all signed up for. If the government and the Sherpa come to an agreement soon, Marcus and I will continue trudging uphill until we can go no further. If they decide to not give us that opportunity this year, we'll go home early, hug and kiss our loved ones and know that we've been lucky to have had the opportunity to spend time in these mountains and share many wonderful times in the Khumbu Valley with our mountain loving Sherpa brothers.. This picture was taken today as my friend Dawa Sherpa was leaving base camp. Dawa is the man who was by my side when the avalanche struck. He's the guy who spent all day yesterday digging his friends and neighbors out of the snow and sending their limp bodies hanging on a cable from a helicopter down to base camp. After a long 16 agonizing hours he showed up at my tent, before going to his own, to make sure I was ok. He's an amazing man and I have great respect for him. He's a perfect example of the selfless Sherpa people that we entrust with our lives while on the mountain and who we quickly learn to call our friends. The Sherpa community here in Base Camp is naturally quite shaken by this event and most of them have decided to step back from this expedition for a few days, trek home to their villages and reassess the situation with their families. Unfortunately the death toll is still climbing. We have recovered 16 lost souls as of an hour ago. We're hoping to locate two more of the missing today and get them back down here to BC, one way or another. This scene is a lot for us western climbers to take in so I can't imagine what our Sherpa partners are really feeling and thinking as we all witness the worst disaster in Everest history happening in front of our eyes. - This accident was just that - an accident; an act of nature where we humans happen to be in the way. It was not caused by "overcrowding". Matter of fact, there were only about 40 of us in the entire icefall and we were spread out. There was no one waiting for others in order to move up and no congestion anywhere in the icefall. It appeared to be perfect climbing conditions right up until the moment the thunder struck. - The avalanche took place just below camp 1 at about 19,000 ft and the time was approximately 6:45 am. - The Sherpa that were lost were carrying loads to support the upper camps. The fixed lines and ladders through the icefall were already in place. There were very few western climbers in the area and all of us had our climbing Sherpa by our sides and they all survived. - The trash scene on Mt Everest is not what it used to be. Through the great efforts of many organizations and individuals this mountain has been cleaned up and looks wonderful. All too often we hear stories about the abuse of nature but we rarely hear when people have gone to great lengths to reverse the damage. Everest is one of those stories. Excessive trash did not cause this to happen. There is absolutely no garbage that I saw anywhere in the icefall. Actually we should all be proud of how good this place really looks. This was a random act of nature. This is a tough time for everyone here on the mountain but accidents, and even death, are part of the deal. If climbing Everest were easy and risk free, I suspect we'd all take a hike to the top of the world. The price that has been paid over the last 24 hours is a large price indeed. I guess the climbing Sherpa as well as all of us western climbers need a few moments or days to re-evaluate what's worth what in this life. Early this morning I read a comment written about me where the author said, "I hope he finds what he's looking for up there." I appreciated that notion because it got me to thinking about what am I looking for, and I think I have found it whether I see the summit of Everest or not. I'm looking for an adventurous life. I want to see the whole world and all of its people. I want to lay in my death bed and know that I did and saw all that I wanted to in the time I spent spinning through space on this ball of mud. I want to know that I lived fully! So far in this life the things that I regret the most are the things I didn't do; the things I didn't have time for; the situations that scared me to much. I want to push myself to do and see until I can't anymore. I want to inspire my two boys to aim high, to take from this world and give to mankind more than they can imagine now. I hope I have a lot of life left to live and I hope I keep finding what I'm looking for. I'm glad my friend brought this topic up because I needed to remember today just why I'm here. I'm so flattered that so many of you are following this adventure. It's awesome that I get to follow my dreams and I remember everyday that all of this would be hollow and meaningless without all of you being part of my life. Please send positive thoughts or prayers to the families of our fallen Sherpa brothers. As some of you have heard by now, there was a large avalanche in the icefall today. It came down off the left shoulder of Everest just as we were entering the "football" field, which is just below camp one. Marcus and I were each pushed down behind large blocks of ice by our Sherpas which shielded us from the brunt. These guys are truly amazing! They saved our lives! We are shaken but ok. Unfortunately there are some still up there who were not so lucky today. As I write this I feel emotional and don't know what to say. One thought is that we were SO lucky! But the overwhelming feelings are for the poor families of the people that didn't make it. I'm so near to this situation right now that I can't think straight. Of course we are all asking ourselves that serious question of "why are we here??" I don't want to try to answer that question in this state of mind but it is the big question floating over our whole camp today. I'll close with these thoughts; I feel so grateful! I do know this is part of climbing these big mountains and I'm willing to accept the risk. But I do love and appreciate my family and friends more than this adventure. I have a wonderful life and I'm SO lucky today. If I didn't have all of you in my life none of this would matter. I just wanted you all to know what happened and that I'm ok. Thank you for being part of my life. As a buddy of mine reminded me in times like this.."Stay calm, say a prayer, move forward." Just in case you hear something on the news . . .
Jon called to say that he and Marcus are OK. They were in the icefall when an avalanche fell off the west shoulder of Everest onto the icefall between the Football Field and Camp 1. Now he's safe back at base camp. CNN says that up to 10 people are missing. Jon and I are counting our blessings. I'll try to send this picture in high res so it can be blown up. It's WONDERFUL that we have wifi here this year but its not the greatest. Even though our faces are not seen well here the best part of this picture is. You can see why they call it an "icefall". In this picture the flow line is visible from its origin on the Lohtse face all the way down the hill where it turns left and passes base camp. If you are able to blow this up you can see most of BC in the lower left corner. The highest mountain (with the dark black face) in the upper center of the photo is Everest! The intended route up will be the right hand side of that dark triangle. Where that dark south rib comes down and meets the iceflow is called the South Col. This will be our high camp at 26,000 feet. If you check my Spot-tracker activity from today you'll see where I took this photo. A few of us climbed 1200 feet up the opposite side of the valley in order to help with our acclimatization and to get a good look at our adventure. Tomorrow we'll rest and hopefully head up through this maze in the next few days. I miss all of you and home but this place is amazing. I was standing in camp looking up at the icefall today when one of my team members quietly said "I just can't take it all in"...... Simple statement but so well said..
Base camp is such an interesting place at this point in the season because everyone's thinking about the icefall. We all realize that our chance at this hurdle is rapidly approaching. Some of the season's first climbers go tomorrow. As you see in this picture, we have a couple of ladders set up here in BC where we can practice. Some like to set their heal first, some balance on their toes first, maybe step one rung at a time, or maybe two feels more natural. What I find interesting is that so much time is spent on learning the ladders when it's such a small piece of the puzzle. Not many of us come right out and say it but I suspect this is most everyone's biggest concern while on this mountain. So many conversations over the last few days have drifted until someone mentions the ladders and then everyone listens up. Looking at this setup where we're two feet off the ground doesn't look too bad but what we're seeing in our minds is a 300 foot drop into blackness beneath the rungs. Even the most experienced guys up here will offer advice like "just try to focus on your boot placement and don't look down too far." It's an exciting time! I'm scared a bit and at the same time I can't wait to get back up there. The background in this picture is the actual icefall itself, or at least the bottom part of it. I'm sure most of you realize that these pieces of ice that look like popcorn are the size of buses or even as big as houses. I was having lunch today with an experienced climber from Mexico who's going to try to climb this hill for the third time. When the icefall topic eventually came up he said "the trick is to keep your head down and not think about those blocks of ice hanging over you...but for God's sake keep an eye on them just in case they decide to fall on you" :-) I guess it's like everything else in life, it's just a balancing act.. In photo one we see a decorated "pilot" yak. This guy was so proud of himself I just had to take his picture as he led his team past us, back downhill for another load. He carries at least 10x the load each of us do so we've come to have great respect and gratitude for these creatures. The next shot I found intriguing: a herd of Yak and Nak moving through the field near Pheriche as a helicopter hovers above waiting to land. Both chopper and yak now compete to provide transportation services to BC. The old versus the new, side by side..
Third photo: I think I heard mama yak explaining to baby yak to look at the mountains - the mountains where she'll spend her life helping others fulfill their dreams..
No matter how we get up this hill we all need the blessing of the local Lama before we proceed. It was an hour long ceremony where he chanted quietly as he looked us over. Eventually he blessed each of us by touching foreheads and draping our necks. Even though we couldn't understand much of what he said the blessing somehow offered a sense of peace. As our friend Mr. Thoreau said "go confidently in the direction of your dreams. Live the life you have imagined". It's awesome to get the chance to follow his directions. What a life . . .
We made it to BC - our home for the next few weeks. In the pix attached you can see the interstate trucking service that we used to get our duffels up here. Much more reliable than Mack trucks but they're also a little bit opinionated. When they decide to pass us on the trail we simply step aside and hope they don't swing their head too much. Also is a picture of the us arriving at the official BC gateway. Left to right, Andreas, me, Marcus (who will stay with me throughout) and then Bret. Andreas and Bret will leave today for their long trek back to Lukla for a flight out to Katmandu. We're feeling good overall and plan to start our first trips up through the icefall in the next week or two. In the meantime we're practicing on the ladders in BC, fixing our gear, acclimatizing and resting. Jon and the group of Classic climbers made it to Everest base camp. He called from his sat phone and said that it's going well but it is exceptionally cold. They'll be there a couple of days and then head back to Lobuche. The wifi at base camp is not up and running yet so he does not have access to email to send pictures to the blog. IMG posted some pictures of base camp. If you click the top picture on the April 9th post, you can see Jon at the back of the dining tent on the left. Click "Next" and it scrolls through a lot of good pictures of base camp and the mountain. Jon is in the first "Classic" team. Last night, he called from his sat phone to let me that all is well. 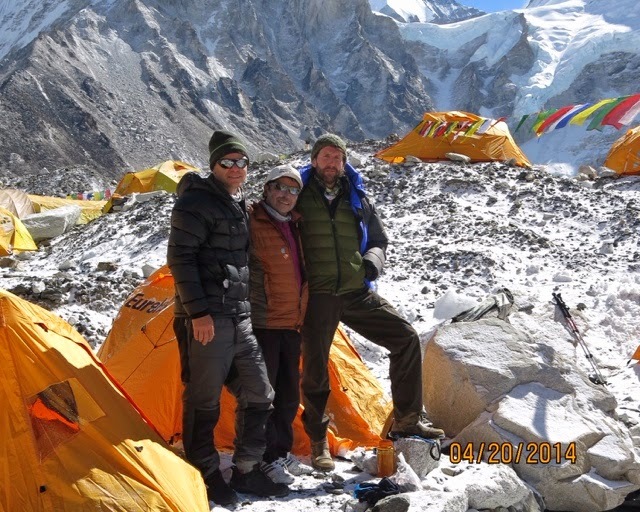 They are at Lobuche base camp and are heading for Everest base camp tomorrow (tonight our time). This is Lobuche and it's just over 20,000 ft, same as our Denali (McKinley) in Alaska. It doesn't look that high because I took this picture from 14k ft yesterday. We'll climb this first as a warm up, if you will. The idea is to get the body to realize that we're headed uphill and get the kidneys to jumpstart the making of red blood cells. This in turn will enable us to move much more quickly through the icefall. We want to do anything we can to minimize the time in these dangerous areas so we do what we can to increase these oxygen carrying red cells. I thought you might be interested in the thinking behind climbing a "bonus" mountain on our way to the big one. I'll be on the back side of the moon for the next three days with no communication. I'll check in once we hit Everest BC about 4 days from now. We moved up to Thyangboche at about 13k feet yesterday. There's a monastery here which has attracted trekkers and mountaineers for 100 years. In the pictures attached you can see that this is the exact spot where Ed Hillary and John Hunt made their original base camp in 1953. It's special to us that we are here today to stand in the middle of his camp and try to imagine what his thoughts must have been. Surely it crossed his mind that everyone who had ever tried what he was about to do had failed or was dead. He was one man who deserved his knighthood! I also included a picture of a monk named Tashi who runs this monastery. When Susan and I met Tashi last year, we were impressed with his sweet gentleness. He explained to us today that this is not a big prayer day so he and the others will only meditate/pray for two 3 hour sessions. He's dedicated his life to this place. Way out here in the mountains, several days walk to anywhere, and he sits and prays...year after year after year. This world is full of amazing people that we'll never know or hear about..